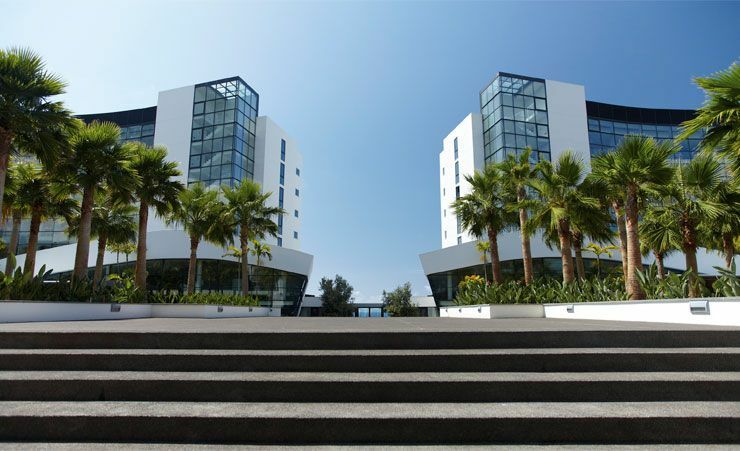 The Vidamar Resorts Madeira is a glittering jewel of a hotel – its clean and contemporary fascia and décor give it a very prestigious look and feel. Situated on the West side of Funchal, the island's capital, it gives easy access to the fabulous city, and from there, the Old Town in the East – where you'll find so many of the city's best attractions. As you would expect of one of Madeira's foremost hotels, picturesque ocean views are abundant. Just step into the beautiful hotel gardens and you can look straight out to sea. Funchal looks like one of the world's foremost garden paradises – and it's well within reach of us Europeans. So isn't it wonderful that hotels like the Vidamar Resorts Madeira manage to maintain such impossibly high standards? One might think it would be impossible to match those views, or that staying in any hotel would feel like shutting yourself from all the beauty out there. That's certainly not the case at the Vidamar Resorts Madeira. This is a light, airy and open hotel and totally given over to your comfort. Rooms are truly luxurious and have private bathrooms, as well as fabulous balconies overlooking the gardens and the ocean. Featuring cable TV, phone, refrigerator and more, you'll have all the facilities you need. Holidaymakers to Madeira will certainly have ample opportunities to swim – and the Vidamar Resorts Madeira provides some of the best. 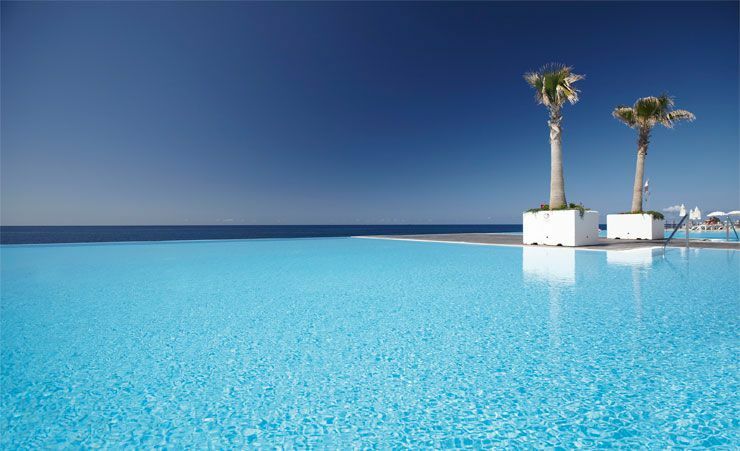 You can choose from a superb indoor pool and a dazzling array of three outdoor pools, as well as the amazing Mar Sea Spa Thalasso facility. Not to mention the ocean itself –- easily accessed from the hotel. 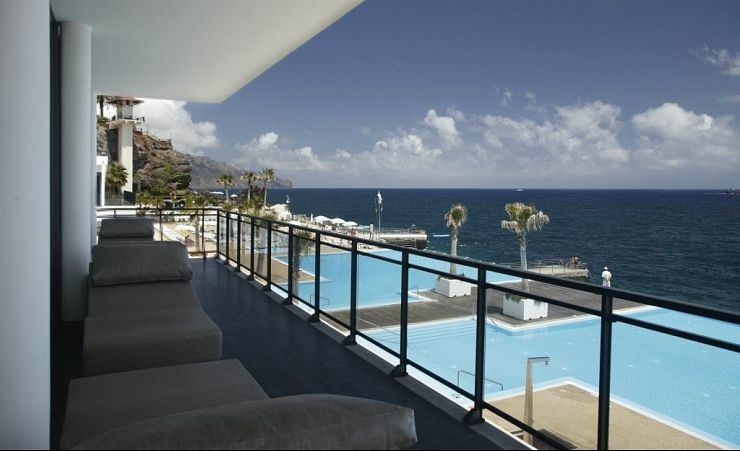 The Vidamar Resorts Madeira a five star hotel in a five star location. Your stay there will be luxurious, laidback and full of that special kind of Madeira magic. Half Board Dine Around offers a range of dining options & allows guests to sample a variety of cuisines at a selection of restaurants. # FREE Wi-Fi~for stays of 9 nights & over. Applies stays 01/05/15-31/10/15 and FREE Wi-Fi for stays of 10 nights & over. Applies arrivals 01/11/14-30/04/14. ^ 0 to 3 years old. July to September. Must be booked 24 hours in advance and a surcharge applies. Breakfast and Dinner. 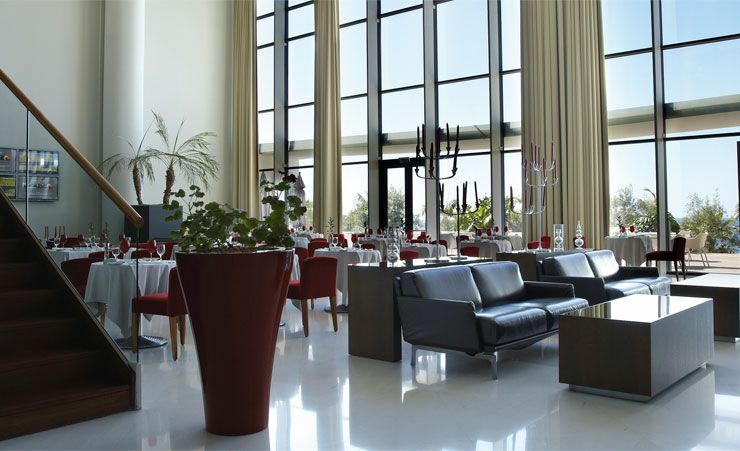 Includes the use of 4 restaurants, includes the Ocean buffet restaurant, the Mamma Mia Italian restaurant, the Koi Sushi Restaurant and Casa das Espetadas Restaurant. 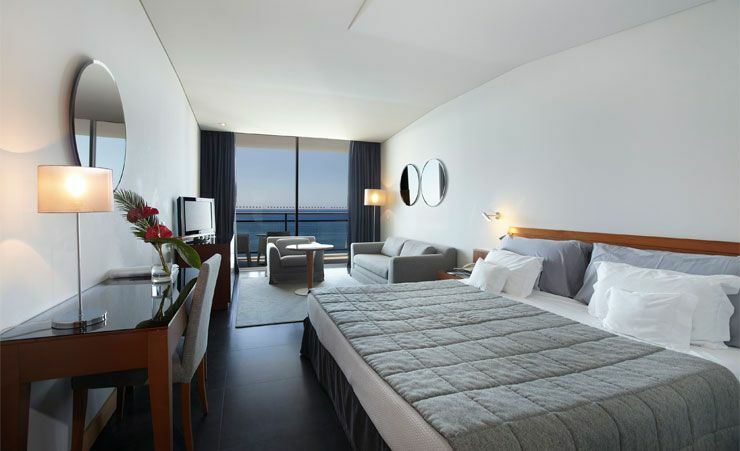 Find out more about your accommodation and the in room facilities at the Vidamar Resorts Madeira . These spacious rooms are comfortably furnished with king, queen or large twin beds, sofa, dining table, plasma TV and free Wi Fi. All rooms have balconies that overlook our beautiful gardens and partial ocean views. Marble bathrooms with a bathtub, shower, bidet and twin wash basins. A room with a private balcony overlooking the garden; equipped with twin beds or a King Size bed; WC with bathtub and shower; hair dryer and magnifying mirror, robe and slippers. 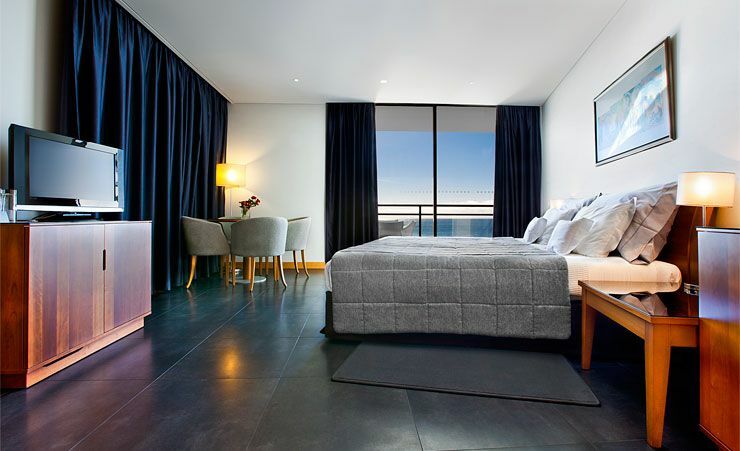 A room with a private balcony overlooking the Ocean; Double bedded or King Size Bed, WC with bathtub and shower; a hairdryer and magnifying mirror, robe and slippers. It is equipped with individually controlled air conditioning, free safe, refrigerator, kettle, cable LCD TV with 30 channels, directline telefone, wireless internet and 24hour room service. Situated on the southeast coast of Madeira, the beautiful town of Funchal is the region’s capital and the first place settled on the island. It’s also the largest and most popular holiday resort! Funchal is split into three distinct areas: to the east visitors will find the Old Town, around the harbor you’ll find the buzzing central commercial area, and to the west, you’ll find the Lido, where the majority of popular hotels are located. Funchal in particular and Madeira in general are hugely popular for travelers and tourists because the region enjoys what many consider to be a ‘perfect’ climate all year round. If you’re looking for the best time to go, though, we recommend June-September when you’ll experience highs in the mid-20’s and virtually zero rainfall. Want to avoid the summer crowds? Head to Funchal in May, October or November where you’ll still enjoy nice, warm days, but with fewer people around. While rainfall is more likely, the region doesn’t get more than seven days of rain maximum per month throughout the year. Whether you prefer lounging on the beach or sight-seeing, there’s plenty to do in Funchal. 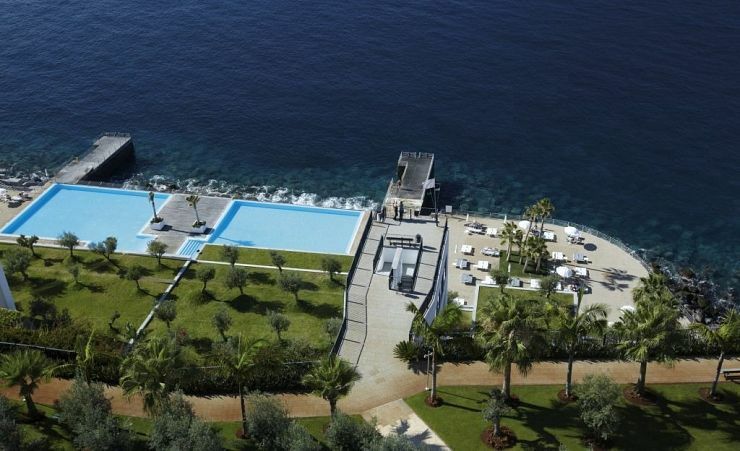 The Funchal Lido is one of the most notable attractions featuring a large solarium, two salt water pools and access to the sea. You’ll also find dozens of hotels and resteraunts nearby. If you’re keen to get out and explore, check out the Madeira Botanical Garden, just south of the harbor. There, you’ll find hillside gardens, stunning sea views and a bird park. For a taste of local life, head to the Funchal Farmers’ Market. This famous market selling local fruits, vegetables, flowers, and fish was opened back in 1940 and visitors are welcome every day but Sunday. There are a number of beaches in Funchal. Formosa Beach is the only public beach that runs along the promenade and has historical importance dating back to 1508. Gorgulho Beach is a typical pebble beach off the Lido Promenade that has a bay perfect for relaxing. Finally, Sao Tiago Beach is popular among locals and is also known as ‘Fisherman’s Beach’. Like the others, it’s a pebble beach with free public access. As the islands most popular resort, you’ll find restaurants of all kinds, from trendy tapas restaurants to hidden gems serving local fare. If you want to play it safe or are looking for home comforts, you’ll find plenty of options, too. While you can, of course, spend your holiday relaxing, if you’re in the mood for a drink or some live music, Funchal is the place to be. Downtown you’ll find more modern discos and clubs, in the Old Town you’ll find more quiet cafes and bars, and near the marina you’ll find handcrafted cocktails. Because the town of Funchal dates back several hundred years, there is a wealth of history and culture to explore while you’re on holiday. In particular, look out for the beautiful Episcopal Se Cathedral and Church of Our Lady of Monte. For those looking for recreational activities, walking the levada footpaths is must. You can hike these man-made irrigation channels across the island, enjoying views that are impossible to beat. If you aren’t keen on walking, take the Madeira Cable Car up to see the beautiful views surrounding the capital. Of course, a trip to Madeira isn’t complete without some water activities. Because of Madeira’s position in the Atlantic, it’s an especially great plate for whale and dolphin watching. There are several catamaran cruises available. While Funchal is the largest town on the island it is still easy to get around on foot. There are also local buses available and cars to hire. Spa Special: 2 days FREE entrance per week to Thalasso therapy wet area. €50pp voucher per booking given locally when staying a minimum of 14 nights. 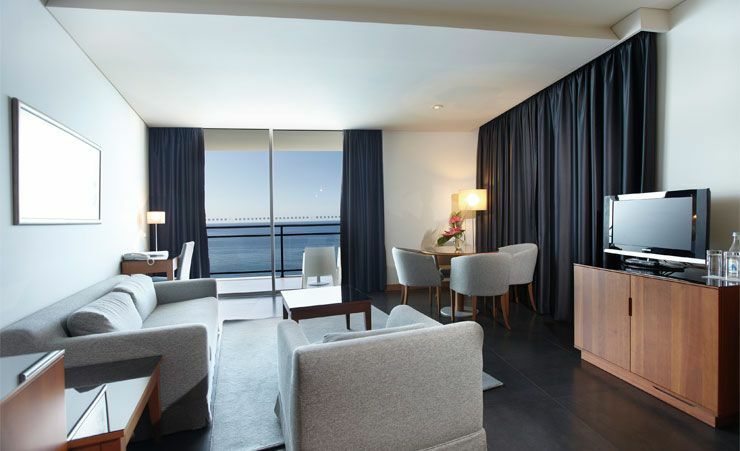 The Vidamar hotel is an excellent place to stay in Madeira. The sea view from all rooms, the beautiful gardens. Breathtaking infinity pools, live music in the evenings. The food was delicious, varied and cooked well and presented buffets. The friendliness and excellent service provided by all members of staff. Excellent Mercury rep. Sorted out a missed excursion with speed & efficiency. Lovely hotel, great position and fantastic staff. Very pleased with the whole experience and will definitely use your company again and indeed, recommend you to family and friends. Wonderful location and facilities. The Spa was exceptionally good. All hotel staff anxious to ensure you had everything you needed. Great hotel, fantastic pool area and facilities. I enjoyed the spa. Food was great. The choice in the buffet was good and having the dine around option was even better. I visited the Sushi, Italian and Portuguese restaurants during my stay and all were good. The food in the sushi restaurant was exceptional and the ambiance in the Italian made for a lovely evening. Lovely hotel, very clean, excellent service and friendly staff . Everyone is so helpful and willing to please. Hotel was excellent - great facilities and beautiful views. We never had a problem getting a sun bed if we wanted one and the pools are just beautiful (though cold!) The room was large, and bright and air conditioned with a fantastic view from the balcony and had everything you could need as well as being cleaned and re-stocked every day. The whole hotel was immaculately clean and bright. Reception staff were always happy to help and recommend good restaurants etc. 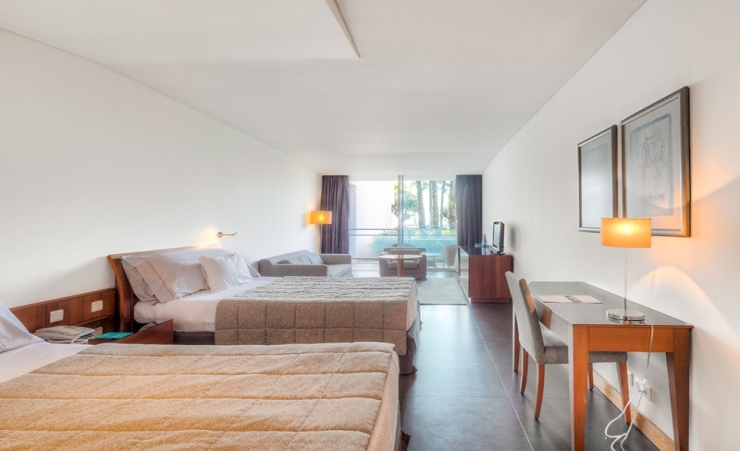 The position of the hotel is ideal - it's about a half hour walk into the main town of Funchal but the hotel does have a courtesy bus which has to be pre-booked. This is sometimes full so an early request would be a good idea if you don't fancy/can't manage the walk. The staff at the hotel were very helpful. We arrived at the hotel at 9.15pm, as our plane was delayed, and as the restaurant finished at 9.30pm we were taken straight down and had a meal, while our cases were taken up to our room, which felt a really good start to our holiday. Our room had a fantastic view out to sea. 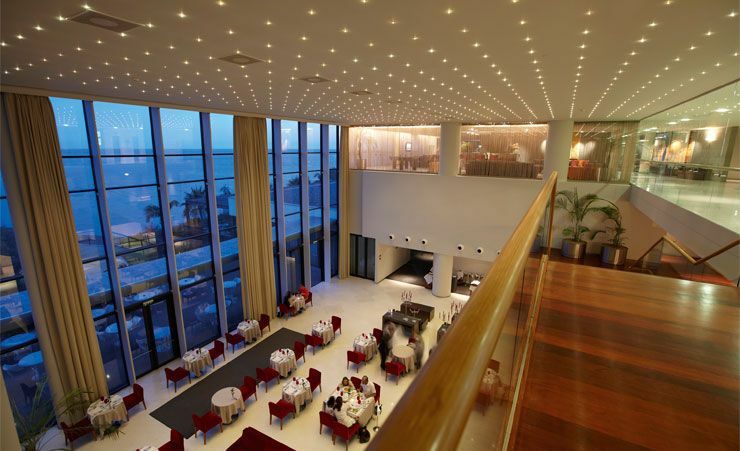 The choice of food in the Ocean restaurant was really good and catered for everyone tastes. 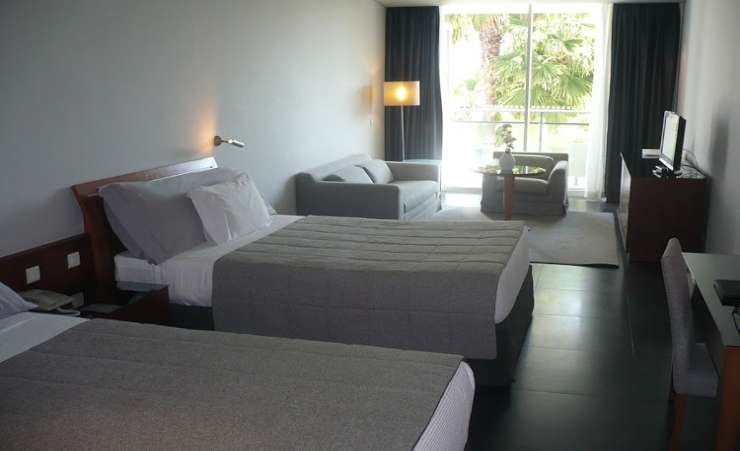 Great place to stay in Funchal all facilities within easy walking distancence. Staff and service very good as our previous visit . Will go again. Excellent hotel, good food very helpful staff. Well placed for walking into the centre of Funchal. Rooms are large, comfortably furnished and immaculately clean. Fourth visit. We love it! The staff were helpful and friendly . It was a very ,very comfortable place to stay. A wonderful hotel all the staff were helpful and friendly .we were upgraded to a wonderful superior ocean view .room number 711. we enjoyed the dine around particularly the Japanese . The breakfasts and dinner were excellent amazing choice and quality of dishes . One of the best hotels I have stayed in.Just loved everything about it. We enjoyed the "Dine Around" offer enabling us to eat at any of the hotels 4 connected restaurants. Everything about this hotel was perfect,and my highest recommendation is my plan to return. Magalana at the beach bar in the gardens was very good. Always had a smile and very efficient. In the restaurant Crissy was always there to show you to your table with a smile and little portugese lesson. Not forgetting my special friend in the restaurant. The entertainment needed to be a little better. The duo where very good but who wants to hear a trumpet player. Everything about the hotel was excellent except for the staff who were so far above that level it is difficult to find the right words. Every staff member we met from gardeners, waiters and waitresses, receptionists etc went above and beyond to be helpful and friendly, it really made the holiday special for us. Everything was spot on. The only thing I wasn't happy with was the hairdryer! The hotel was in an excellent location and it was easy to use public transport from it. The bar prices were reasonable for a change and had an excellent variety of drinks available. All staff very pleasant and extremely helpful. Would gladly use Vidamar again. High standards and very good staff. Great hotel. Likely to return and I'm already booked with you for Cyprus next January. We have travelled with Mercury Holidays before and are very happy with the company. A very big hotel with a lot of amenities. Although it's a big property, it never felt busy or overcrowded. It was very well managed with great food and quite modern. I've travelled with Mercury before and would definitely recommend the company. It's always been cheaper than other operators I've checked my specific holidays against. Always professional and everything you would expect from a great travel agent. Hotel was great we couldn't find any faults .The staff were excellent . hotel wonderful , staff warm and friendly Room large comfortable and beautiful view.. immaculate in cleanliness. the breakfast buffet was excellent but we found the dinner buffet a bit short in meat and chicken choices. Lots of fish but we are not too keen on fish. Not much of a selection on potato dishes either . Salads were really good as were deserts but we just felt we had little choice on the main courses . of course this is our personal opinion . despite these criticisms we would return to the Vidamar in the future. An excellent hotel with superb food and very helpful staff. Very good facilities. The atmosphere is calm and it's a lovely haven away from the bustle of Funchal, however this would depend on the time of year. The room ( 439 ) lacked a mirror and decent light over the dressing table. The food was of a good standard but a little too fussy for someone suited to a more basic palate. The entertainment was very limited & consisted of a guitar/drums duo who were quite good & a very poor singer & reasonable pianist. Several nearby restaurants & hotels had very good cabarets or local groups. Why not in a 5 star hotel? Hotel staff friendly and helpfull. Relaxed atmosphere throughout the hotel. Need to understand that it is essential to use boiling water to make a good pot of tea. Need to use less salt in preparing the food. There was some work being carried out to repair sea defences this resulted in some noise but hotel compensated by giving a cocktail party for guests and free wine with meal on one evening, plus a Carnival cocktail party, show and disco on another occasion. The noise did not really effect us but it was a very generous gesture on the part of the hotel management. Furniture in the bedroom was not particularly comfortable. Lighting in the room very poor, could do with brighter lights then we would be a able to read! The staff were excellent, friendly and always helpful, nothing was too much trouble. Hotel meticulously presented throughout. Food excellent and varied. Good selection at the buffet each day. Bars are well run, with a good choice of cocktails, expertly provided. All staff, without exception, are helpful and friendly and will go the extra mile to ensure satisfaction beyond expectation. An excellent hotel in a good location. Some of the service was not 5 star. Lovely breakfast and we enjoyed dine around option. A hotel we would return to. Great location, staff excellent. The rooms were superb with lovely sea views. Food was very good. My friends and I would highly recommend Mercury, especially as we had our own rooms at a good price. First class hotel, nothing is any problem to anyone at this hotel, it is perfect. A very good 4 to 5 star hotel, served extremely well by one of the most friendly and helpful teams of staff I've ever encountered. Absolutely fabulous...couldn't fault it...hope to go back. Very welcoming, helpful and pleasant. I have stayed many times in this hotel and love it. It is light and spacious and very calm. The staff look after me superbly. Great vale for money for the quality of the facilities. We were delighted when we walked into the Vidamar hotel and finally settled into a fabulous room which looked over the sea. 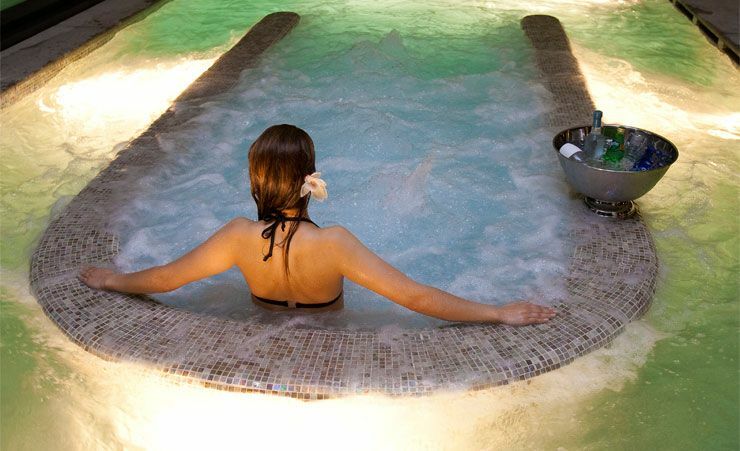 The staff were curtious and very upbeat, creating a very relaxing and luxurious environment. I would have no hesitation in recommending anyone to try and enjoy the Vidamar as we both did. Couldn't fault the hotel, my husband and I had a lovely time. J Hamp. Quite the best holiday hotel I have ever stayed in - I did upgrade to a room on floor eight rather than stay in aroom which overlooked the garden and which was not immediately ready. I paid for the upgrade. >Food quality was very good but was marred by consistently being served almost cold. 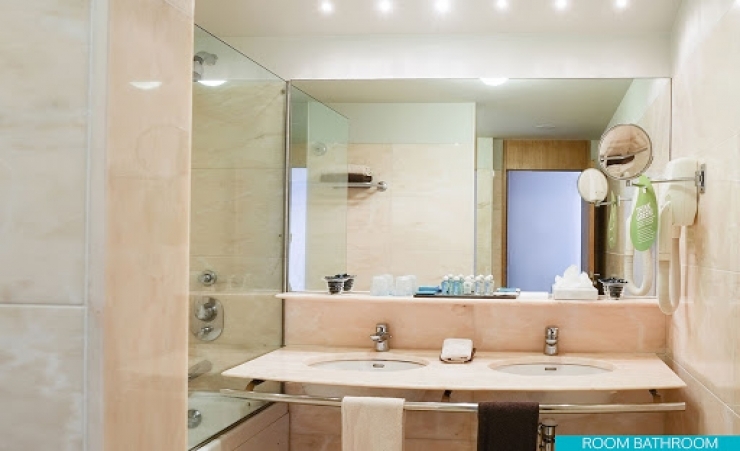 >Despite the abundance of mirrors throughout the hotel( eg two walls of the toilet!!) there was not a mirror over or on the dressing table which meant that you had to rely on the one in the bathroom to do your make up and hair. This was not convenient if someone was using the toilet. >If the hotel cannot use the usual dining restaurant because there is a private function they need to reconsider how they organise the meal service for the hotel guests. On the 9th we ate in the Ocean lounge . It was a buffet but there was such poor organisation that people had to queue for ages to get to the food which frequently ran out and which was very slow to be replaced. The room could not be faulted. The staff were able to help whenever needed but not at all intrusive.